The EAW Radius Family of loudspeakers (left) and the Mackie Axis system EAW and Mackie are touring the U.S., showing their new end-to-end audio solution designed for production and system integration. Featuring stops at all key U.S. markets, the L3 Tour kicks off on July 11, 2016, running through Labor Day. If you are interested in pre-registering for a stop near you, sign up for more info at http://bit.ly/L3USTour. The L3 Tour features a new audio system designed to speed up setup time, reduce system costs, and deliver a faster, more intuitive workflow. EAW's all-new RADIUS loudspeaker line harnesses technologies typically reserved for high-end applications. Smart features like array self-detection and optimization are designed to drastically cut down on setup and tuning time. The new EAWmosaic app provides total system optimization from anywhere in the venue, plus intuitive room design and prediction in a single, comprehensive application. With the proven sonic performance of EAW's acoustic design and DSP mastery, plus full Dante integration across the line, RADIUS delivers an intelligent and flexible system designed to be easy to use, save time, and priced to meet even the most modest budget. "We've really targeted in on the needs of the modern mid-sized production and system integration markets," said Jeff Rocha, EVP of strategy and business development for EAW. "Companies like this have to be nimble and flexible. The combination of RADIUS and AXIS delivers an amazingly intuitive workflow that saves precious setup time for production and deep customization that will appeal to integrators looking to meet stringent application requirements." The Mackie AXIS Digital Mixing System is designed to deliver unmatched speed, visibility, and customization for professional production and install. With full Dante interoperability, the modular AXIS system combines the power of the 32-channel DL32R Rackmount Digital Mixer and innovative DC16 Control Surface to deliver a live sound solution with optimal workflow efficiency. AXIS is engineered to be extremely approachable, but delivers the precision controls professionals demand. A multitude of large high-resolution channel ID screens provide easy readability, and the unique SmartBridge handles up to three iPad devices for even more visual feedback. SmartBridge automatically senses when an iPad is in place, enabling intelligent surface-to-wireless mixing. This allows the Master Fader app to instantly adapt to the intended work environment and revert back to its previous mode when placed back in the SmartBridge, delivering a seamless workflow. Complete with flexible 32x32 recording and a wide selection of powerful DSP, the AXIS system is designed to deliver a forward-thinking, modular digital mixing solution with more features per price than any other digital mixer available, according to the company. 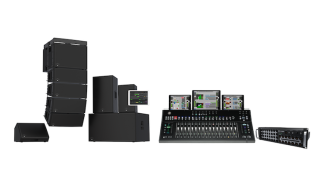 "The Mackie AXIS system is designed to significantly increase workflow speed and customization," said Ben Olswang, senior product manager for Mackie. "When you combine this flexible, modular mixing platform with amazing loudspeaker sonic quality, and these are all on a Dante network, you get a seamless system that outperforms anything even near its price point."